The origins of the regiment start in 1803 with recruiting in the Scottish Highlands. With limited success, the officers and NCOs were transferred to Canada to continue recruiting and raising the regiment. In the following article David Juliusson, a Program Officer at the fort, continues the story of the Canadian Fencibles begun by Ross Flowers in the last issue of fife and drum. as of Dec 2016, a veteran of the Fort York Guard was in his third year studying history at Oxford, found additional sources and wrote a paper. It gives insight into conditions of May 1815 in relation to one Canadian Fencible. A detailed dewcription of the engagement between British and American naval forces from York to Bronte, near Burlington Bay on 28 September 1813. A detailed description of the naval battle that took place from 7 to 10 August 1813. Includes illustrations. The article discusses the need for discipline, methods of making soldiers aware of the regulations, and gives some examples. 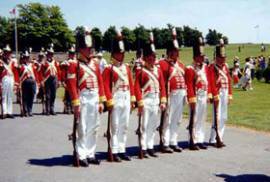 The recreated Canadian Fencibles started in 1986 with a meeting of a group of interested hobbyists, some of whom were already portraying a crown regiment from the American Revolutionary War period. They were interested in forming and portraying a Canadian regiment from the War of 1812-14. The Canadian Regiment of Fencible Infantry, more commonly know as the Canadian Fencibles, was a logical choice because they too had operated in eastern Ontario and Quebec and fought battles in the general area. The first task was to further research the regiment's history, clothing, and equipment. The regiment was very fortunate to have amongst its members dedicated people with interests and backgrounds in Canadian history, military history, military articles collection, and other related areas. Sources for many articles were found, patterns were developed for clothing, and, in a number of cases members were able to produce articles for the regiment. An ongoing goal was historical accuracy of uniforms and equipment and a high standard of drill and actions on the field. The regiment grew in strength. In early January 1990, the Canadian Fencibles were represented at the Battle of New Orleans. Later in June 1990, about 25 members traveled to Belgium to take part in the 175th anniversary of the Battle of Waterloo. The event was popular in North America with many of these reenactors of the 1812 period coming along. In preparation for the trip to Waterloo, the regiment attended the early June Battle of Stoney Creek in full strength and focused on drill, their equipment and appearance, and marching. There they did their final drill and preparations such as branding canteens with the British BO and broad arrow symbol using an iron heated in a campfire. Visitors and reeanctors observed this activity with great interest. Today, after many years of service to the regiment and the King, almost all of the original members have retired from the regiment or have been absent from reenacting for several years. A new generation has resumed responsibilities. We attend one or two events each year where all members strive to attend. For example, in mid-July of even numbered years, we march at Crysler's Farm Battlefield Memorial Park near Morrisburg, ON (http://www.cryslersfarm.com). With great interest in and dedication to portraying and interpreting Canadian history and events surrounding the War of 1812, members of the regiment also attend other events during the year. For example, most years we set up tents and operate a children's muster at the Bath, ON Canada Day festivities as well as march proudly in the parade. We have appeared at Upper Canada Village to assist with their Education Day helping explain and portray the life of soldiers of the 1812 time period. You'll see us at other events too.